Despite the daily circus in Washington D.C., former President Barack Obama said he has hope. 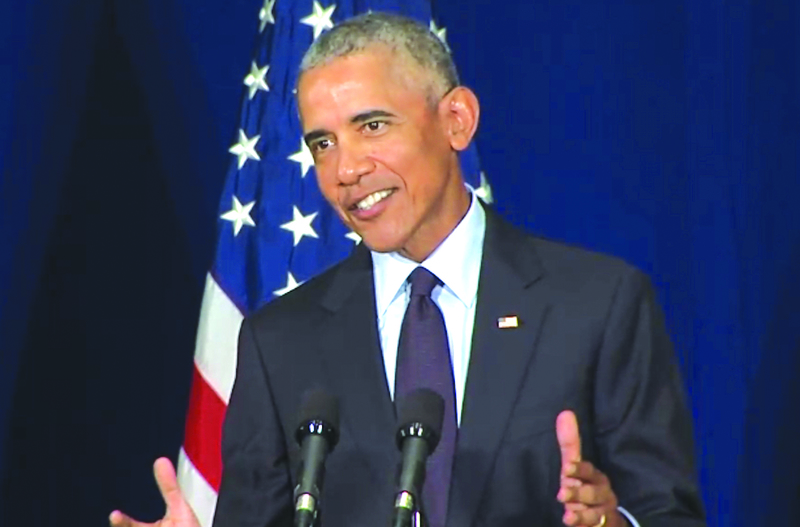 Receiving the Paul Douglas Award for Ethics in Government from the University of Illinois on Friday (Sept. 7), Obama said the emergence of more young and female candidates is encouraging. Obama said the young and female candidates he has encountered have their priorities in the right place. 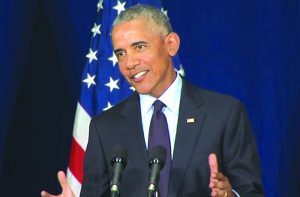 Speaking to a crowd of primarily college students, Obama stressed the importance of young people going to the polls in November’s midterm elections. He noted that in the 2014 midterms, less than 1-in-5 young people voted. Spending much of his talk stumping the Democratic agenda, the former president said even individuals who don’t agree with him on policy issues need to come out against President Donald Trump’s rhetoric of hate. “Even if you don’t agree with me, you should still be concerned with the current course and still want to see a restoration on honesty and decency and lawfulness in our government,” Obama said. The former president said the current political climate in the country is unhealthy, with hate and fear running the show. He said there is no place for partisan politics in basic American tenets like freedom of the press. He said the same goes for people of different races or religions. Obama said that fear and hate speech started long before the current administration. He said the antidote for a government controlled by a powerful few and being divisive is a government that is organized, energized and inclusive. “We can’t sit back and wait for a savior … We don’t need a messiah. All we need are decent, honest, hard-working people who are accountable and have America’s best interests at heart,” Obama said. He lauded the fortitude of young people like the students from Parkland High School in Florida who have continued to demand action in the wake of a mass murder in their school. “They are not giving up until we have a Congress that sees your life as more important than a campaign check from the (National Rifle Association),” Obama said. He said by taking a half-hour to vote in the midterms, students can help change the country’s course. “Thirty minutes of your time, is democracy worth that?” he asked the U of I students. The former president said he is confident that young voters will be agents of change in this election. “I believe you will help lead us in the right direction and I will be right there with you every step of the way.” Obama said.